Arnica is a perennial plant from the same family as the sunflower. The flower grows primarily in North America but can also be found in Eurasia. Its flowers are a deep yellow with an orange centre. The flower is aka leopardsbane and wolfsbane. The arnica flower is used frequently in natural medicine and homoeopathy due to its pain relieving and anti-inflammatory properties. Arnica oil is produced from the flower heads via steam distillation or CO2 extraction. The oil is a light yellow and non-vicious. About 50% of arnica oil is made up of several essential fatty acids such as palmitic, linolenic, linoleic, and myristic acids while the other 50% is made up of thymol, an antibacterial component. Arnica oil also contains helenalin, which is a powerful anti-inflammatory. However, it can cause skin irritation in some people. If your skin is sensitive, use arnica oil with caution. 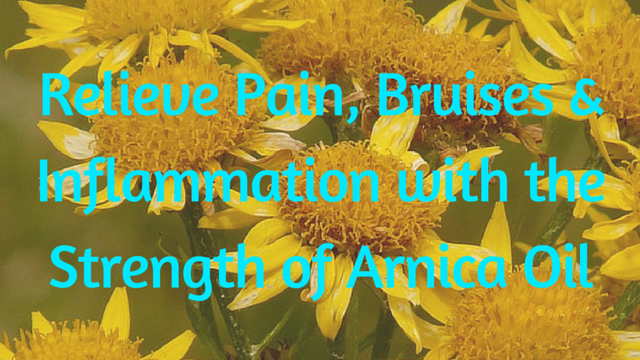 Arnica oil is excellent for healing bruises. A small application of an arnica oil solution to most bruises will facilitate faster healing. If you’re an active sport or fitness person, you’ll be familiar with soreness and inflammation caused by injuries. Applying arnica oil will help relieve the pain and lessen inflammation due to the helenalin contained in the oil. There are some studies that suggest arnica oil is a suitable treatment for arthritis. It should however not be used as a replacement for prescriptions from your physician for the condition. You will need a few tablespoons of arnica oil and MSM powder (eyeball). 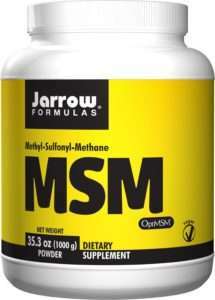 My favourite brand of MSM powder can be found HERE. Combine the arnica oil with MSM powder until a paste is formed. Apply over the problem area and massage in gently. If you have an open wound, do not apply arnica oil to it. Some good oils to combine arnica oil with include grapeseed oil, coconut oil and sweet almond oil. Arnica oil should never be orally ingested as it’s toxic and can lead to irregular heartbeat, dizziness, nausea and irritation. Additionally, if you are pregnant or breastfeeding, it’s a good idea to check with your doctor before including arnica oil in your beauty regimen.